By Dan Ambrose: Gennady Golovkin is likely going to have to wait until 2020 or later for him to get the trilogy fight that he’s interested in against Saul Canelo Alvarez, as the Golden Boy star says his goal for 2019 is to unify the middleweight division in it’s entirety. That means Golovkin, 36, will age a little more while he waits for Canelo to try and finish unifying the 160 lb weight class. GGG will be turning 37 on April 8. He’s not getting younger, and he can’t wait forever to get his third fight with Canelo if it’s to be a fair fight between them. Unless Canelo fights three times in 2019, a trilogy fight with Gennady is unlikely to happen this year. Canelo (51-1-2, 35 KOs) already has Golovkin’s WBA/WBC middleweight titles he won from the Kazkhstan fighter last September in beating him by a 12 round majority decision in Las Vegas, Nevada. Canelo will be fighting IBF champion Daniel Jacobs (35-2, 29 KOs) on May 4 to go after a third title at 160. A win over Daniel will then lead to Canelo attempting to put a fight together against WBO champion Demetrius Andrade in September. Canelo says there’s a possibility of him fighting three times in 2019, but it depends on how hard his May and September fights are. Canelo’s goal of winning the last two remaining belts at middleweight to unify the division probably won’t increase his popularity unfortunately. 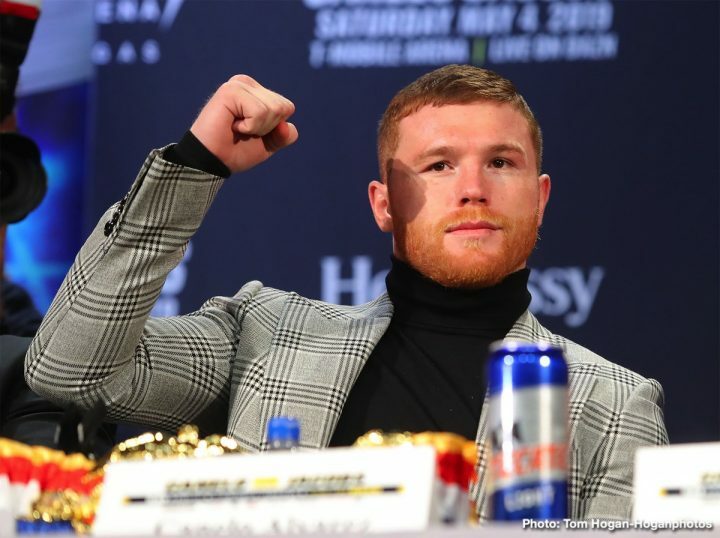 It’s arguably a misguided vision that Canelo has in believing that he’ll gain more popularity from the boxing worldwide and in the U.S if he unifies the weight class. As we saw recently with Terence Crawford unifying the light welterweight division, and Oleander Usyk unifying the cruiserweight divisions, their popularity wasn’t increased to any great level by them putting in the effort to unify. Usyk’s recent fight against former WBC cruiserweight champion Tony Bellew may have done more to increase his popularity than winning all 4 titles at cruiserweight. That single fight by Usyk against Bellew did a lot more than him beating Mairis Briedis, Murat Gassiev and Krzysztof Glowacki to win the belts. Crawford’s next fight with Amir Khan is doing more for his career than him winning all four titles at 140 in the past. You can go down the list. Vasyl Lomachenko would gain more by simply fighting Gervonta ‘Tank’ Davis, Oscar Valdez, Mikey Garcia, Teofimo Lopez or Miguel Berchelt than he will in wasting time trying to unify the lightweight division. Canelo would be better off forgetting about unifying the 160 lb division fighting Demetrius Andrade for his WBO belt in September, and instead look to fight Golovkin in the trilogy match. If not GGG, then Canelo needs to take some risks by fighting Jermall Charlo, Callum Smith, Gilberto ‘Zurdo’ Ramirez, Chris Eubank Jr., Rob Plant, Dmitry Bivol or Sergey Kovalev. Those fights would do a lot more for Canelo’s career than him fighting Andrade for his paper title, which no one will care about. The casual boxing fans don’t care about all the worthless titles that the sanctioning bodies have flooded each division with. The fans wants to see great fights. Golden Boy should know that. Having one world title is more than good enough in this day and age for a fighter to be seen as a quality guy by the fans. Even without a title, a fighter can be looked as a champion. Teofimo Lopez is viewed as a champion level fighter by boxing fans. Canelo doesn’t need to waste his career fighting guys that don’t matter. He needs to be taking the biggest challenges that he possibly can if he wants to become a crossover star in the sport. Canelo makes it clear that he likely won’t face Jaime Munguia anytime soon if ever. “I would not like to fight another Mexican, my countryman, and break that apart,” Canelo said. That might not sit well with Golden Boy that Canelo doesn’t want to fight other Mexican fighters. Munguia is from Mexico, and he’s a fighter that Golden Boy is interested in matching against Canelo in the near future. If Canelo resists that idea because Munguia is Mexican like himself, then that’s a fight that won’t happen. It would be a shame that boxing fans can see those two guys face each other.